The word karabiner (or carabiner) is the shorten form of the the German word Karabinerhaken, meaning spring hook for a carbine. Usually a karabiner is a metal loop with a sprung gate used to quickly and reversibly connect components (such as harnesses, lanyards and pulleys) in safety critical systems. Karabiners are widely used in rope intensive activities such as mountaineering, caving, sailing, rope rescue, construction and window cleaning. They are also more recently used in sport activities like zip wire runs and are normally made from both steel and aluminium. Generally in sports activities where a karabiner is used, it tends to be of the lighter weight aluminium type with the steel type generally being used in more commercial activities. That said it is a personal choice as to which type of karabiner to use. In Europe all karabiners have to be tested and recognised to EN standards and therefore you can be sure that they are safe to use. Karabiners come in four characteristic shapes which are described below. This is the most basic shape and also the least expensive. Smooth regular curves are gentle on equipment and allow easy repositioning of loads. Their greatest disadvantage is that a load is shared equally on both the strong solid spine and the weaker gated axis. This shape transfers the majority of their load onto the karabiners strongest axis which is the spine. Slightly more expensive. This karabiner is a variant of the D-Shape karabiner which affords greater asymmetry, allowing for a wider gate opening. More expensive still. 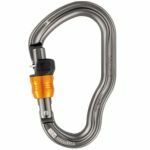 These karabiners tend to be specialized in that they are oversized offset D-Shape and mainly used in belaying. They are also the most expensive and tend to be the heaviest of karabiners. 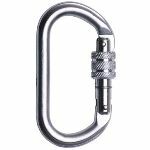 There are basically two types of locking on all karabiners, locking and non-locking. All the karabiners we offer have the locking facility. Locking karabiners have the same general shape as non-locking karabiners, but have an additional sleeve securing the gate. These sleeves may be either threaded "screw-lock" or spring-loaded "twist-lock". These karabiners have a threaded sleeve over the gate which must be engaged and disengaged manually. They have fewer moving parts than spring-loaded mechanisms, are less prone to malfunctioning due to contamination or component fatigue, easier to operate one-handed. They do however, require more total effort and are more time-consuming than twist-lock. These karabiners have a security sleeve which must be manually rotated to disengage but springs closed automatically upon release. They offer the advantage of re-engaging without any additional user input, but being spring-loaded are prone to both spring fatigue and their more complex mechanisms becoming contaminated from dirt etc. They are also difficult to engage one-handed and with gloves on.